What, son? … It’s Elementary! Where to start? Birthday, art, beer … books and Sherlocks galore … just another exciting week. Can there ever be anything else around here? 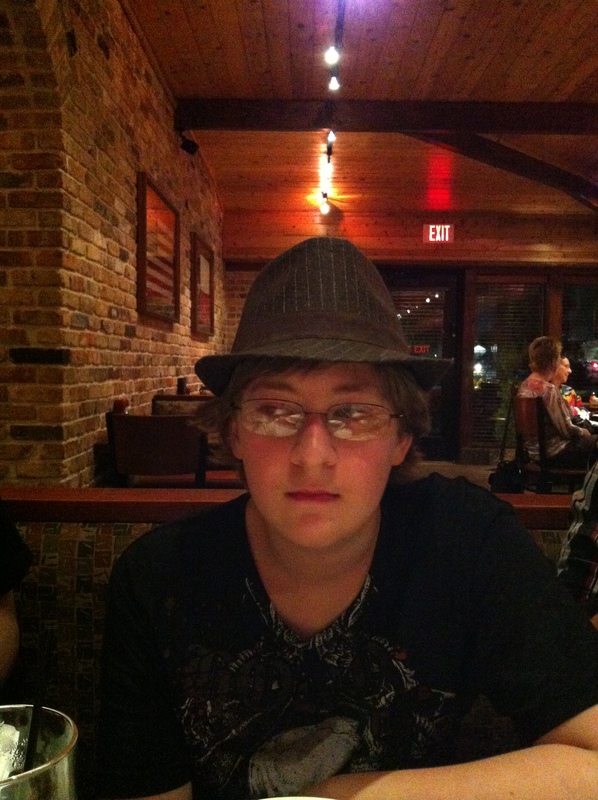 Our youngest son Drew turned 14 on Wednesday. Just the night before, he was standing next to me in the kitchen and I experienced an optical illusion of my peripheral vision: he seemed to be taller than me! Okay…it wasn’t an illusion…he really had grown about two inches in the last month. So I am now officially shorter than all of my sons. But you know what? I can still… [say it with me boys…] … take them! You see, I fully expected oh so long ago that all of my sons would be bigger, faster, stronger, taller, smarter (or some combination of the above) than me. So I prepared for just such an eventuality. In the old days, circuses would tie a baby elephant’s leg to a stake in the ground (for the record, I dislike the use of animals in circuses, but for the sake of an oft-told story…) That poor baby would strain and strain and never be able to pull the stake out. Later, when he was a much bigger adult, he could probably quite easily pull the stake out, but he never did…because he thought he couldn’t. Anyway, Drew had a great birthday with a bunch of friends at JumpStreet (trampolines), a nice dinner with his family at the restaurant of his choice (Cheddar’s), a Reese’s Fudge cake made with love by Momma, all capped with the awesome movie “The Princess Bride“. …I didn’t have to “take him”! Oh well. Didn’t work last year and didn’t work this morning either. Back to the old chemical methods…multiple bags of shock. People shock us all the time. No need to explain, I’m sure. Another shock comes when we mistake small packages for being harmless. Last night I found a tiny ant – it was black and didn’t look like a fire ant – crawling on my hand and before I brushed it off, it apparently bit me right between the knuckles of my first and second fingers. It itched for a while and when I woke up, I thought I had slept on the hand…it felt numb like that. Turns out it was swollen and the numbness was my skin being stretched. A less than three millimeter ant injected enough formic acid to cause that much of a reaction? Shocking! There’s medical shock, impact shock, hair shock (okay, shock of hair), shocks of grain (sheaves stacked for drying) … lots of shocks. But “shock” also has the electrical connotation. As long as I can remember, I seem to have an … (pardon) … attraction to static electricity. I don’t mean that I like or am obsessed by it. No, more like the other way around. I’m sure those who live in dry climates, or even just dry seasonal climates have experienced that spark getting out of a car. Or, walking across a room and grabbing a door handle only to receive a jarring jolt of reality that electricity is all around us. For whatever reason, my body seems to pick up more than the average person. And when it lets go… Bam! I’ve been reading a couple of books on memory while also listening to a Great Course (The Teaching Company) on the subject and I plan to share some of my thoughts in more detail in a later post or two, but I’ll tease a bit here after a couple of other things. First, I have to deliberately, if for deceptive reasons, drop two names: Robert Anton Wilson and Stephen Hawking. It seems right after I wrote a piece about Wilson generating a bit of traffic on my blog (Robert Anton Wilson redux), “Stephen Hawking” suddenly became the search term most used to stumble upon my page. I figure that by mentioning and tagging both, maybe I can get new folks to find me and then stay a while. So, apologies to those led here by that infernal engine only to find nothing of what they seek. I also apologize to Stephen Hawking for pairing him with Wilson. Brilliant scientist juxtaposed with nutcase writer who seemed to not be fond of advocates of true science – oh well, sorry, Steve. Um, Stephen. Um, Mr. Hawking.